You could have a gas leak and not even know it. 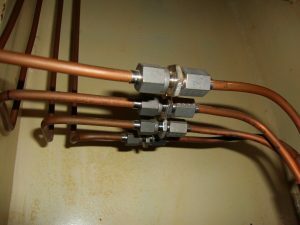 A leak can lead to serious damage and that is why it is imperative that these leaks are caught early by a gas plumber out here in Geelong. Detecting leaks are not difficult when you know how. If you can smell something similar to rotten eggs, then that should be a sign of a potential leak. In the event of doubt – you should still give the experts a call. This is not something to be taken lightly. When you call us, we’ll rush out to you as quickly as we possibly can. Only an expert trained gas plumber will be able to handle the repair work, and speed is critical to fixing the problem. Our employees are able to move really quickly to where you are at, no matter how critical the situation. Gas leaks can occur for a variety of reasons and in all sorts of places, but the biggest cause is usually unexpected wear and tear. Call us in right away to fix the problem. Our services include diagnosing gas leaks, fixing your gas hot water service, pipe installations, fixing your gas heaters, oven and cook top installations. If you’re about to install a new appliance, it is also a good idea to get a licensed plumber to install it. This isn’t something you want installing yourself – as the repercussions from incorrect installation can be huge. Using the needed skills, we can fix your unit in a manner that is both safe and secure. We provide a fast and quick service for all things gas plumbing, so fill out the email form, or ring us immediately if it is an emergency.